I think I have found a longtime obsession in Rocksbox. If you haven’t read some of my earlier posts on it, Rocksbox is a subscription jewelry rental service that charges a monthly flat fee to send you unlimited pieces of high end jewelry. They charge you $19 per month for a selection of personalized pieces that fit your specific style. They offered me a free trial subscription so I could test out the service for myself and I must say, I’ve been more than pleased. The two pieces above have actually been two of my favorites pieces that I have received from Rocksbox thus far. I have always loved the Loren Hope Sylvia necklace, but I received it in one of the brand spanking new colors, Seafoam. It’s a perfect necklace for all of those summer get togethers and day brunches. 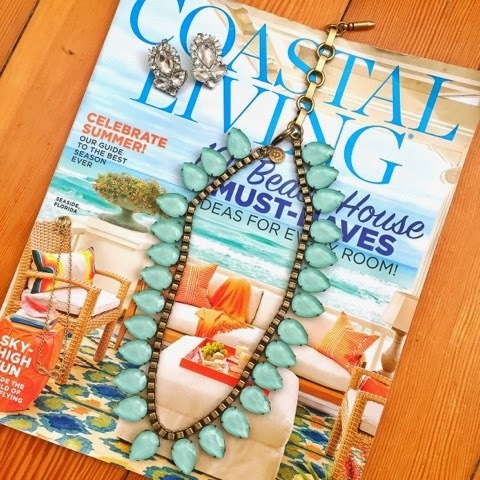 I can just imagine laying on a nice deck chair, flipping through an issue of Coastal Living and hearing the ocean waves lapping onto shore while wearing this beautiful piece around my neck, so zen. Besides the gorgeous Loren Hope necklace, they also sent me a beautiful set of Perry Street Aria earrings that would make any updo sparkle and shine. I love being able to wear the pieces as long as I want and and send them back quickly for new pieces whenever I am in need. It’s a great subscription for those who love to test out jewelry before they buy. You even get a great discount on all the pieces you decide to keep! I definitely can’t argue with that. If you want to try out Rocksbox for yourself, use the code: redheadlovesxoxo to get your first month free! Love that necklace.. and I am also OBSESSED with Rocksbox!! Rocksbox is so amazing and they sent you such a stunner! I would have a hard time giving that pretty necklace back! Oooh that's so pretty. I wish they had Rocksbox in Canada! Love those earrings! That necklace is perfect for summer!